The Durable locker is designed to withstand daily use and abuse. It has a 2 mil thick powder coat baked enamel finish. The latch channels have nylon glides and latch hooks have rubber bumpers to reduce noise. All doors come with Recessed handles and multipoint latch with a 16 gauge continues piano type hinges riveted to both door and frame. 66” & 78” have a shelf for storage of books and small articles. 18” deep lockers or more come with a coat rod and coat hooks. Accommodates two people in the same space as a single tier locker. Accommodates three times as many people as the one tier lockers in the same floor space. This is a space saving model that has sufficient space for two people while occupying about the same space as a single tier locker. Full book compartment doors. All models 18” deep or deeper include coat roads. 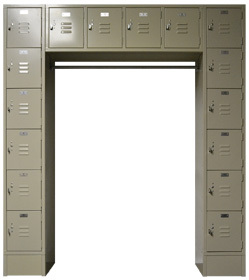 4, 5, 6 tier lockers are known for their compact dimensions. It allows multiple users in the smallest amount of floor space possible. They have a friction catch door pull that allows the use of built-in locks or padlocks. Note: (1,2 & 3) Tier Box Lockers have 16 gauge bottoms (4,5 & 6) Tier Box Lockers have 24 gauge bottoms. It accommodates 16 users in only 69” floor space. It includes a 45” coat rod. It can use built-in locks or padlocks. Efficient storage unit where space is an issue. It has 4 private compartments with a coat rod for 16 coats. It can also be set on counters or cabinets without the coat rod.